Doodles that can be used as flash tattoo designs if you wish. Updates on Sundays. So... I wanted to do something simple, with just flat colours, no shading. Of course, things never happen exactly how I want them ^^'. This work by tattoos-and-doodles.blogspot.com is licensed under a Creative Commons Attribution-Share Alike 3.0 Unported License. 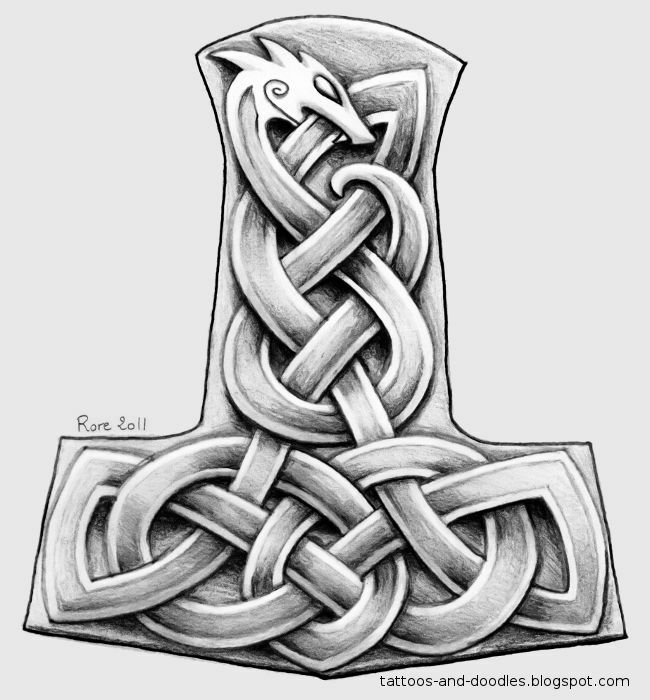 I was wondering if I could use this pattern on a leather project I am currently working on. 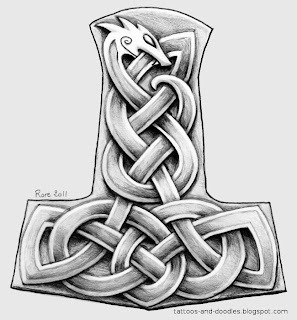 After searching the internet and looking at so many different versions of Thor's Hammer I find this one to be the most appealing of them all. Yes, you can use it. It would be nice if you could send me a photo (a link) of the final leather work, but that's not compulsory. Well wont be doing the final piece for a little while, a month or two. Although I will send you pictures of it and the practice pieces once they are done. I did this on my right shoulder. Thanks! Cool design i changed it a little, then used it to make my own wooden pendant. carving is a great word hehe i don't know how to do that well either. i just took an old beechwood cutting board, took a hacksaw for the rough outlines and keyfiles for the finer outlinning. All designs are copyrighted to me (duh, that should be obvious). You can get tattooed any of the tattoo designs I draw (or to get tattooed something inspired by them, of course). For other uses, my designs are released under a Creative Common license, which allows you to share and modify my work, as long as you correctly attribute the work to me/this website, and as long as you share my work (or your derivated work) under that same licence (or a compatible one).